From electric fireplaces, gas log sets, and outdoor fire pits to DIY and inspirational style/design content, GasLogGuys.com is your go-to resource for all things heating. Winter may only last a few months, but the warmth and ambiance of a roaring fireplace never goes out of season. Call us with any questions – we’re here to help. Found a better price? We'll match it. This product was already in the list you selected. Try again with another product or choose a different list. Please enter a name for your new list. This product was successfully added to your list. A problem occurred while adding this item to your list. Please refresh the page. 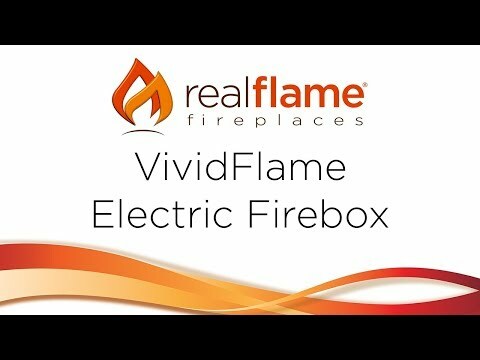 The Vivid Flame Electric Firebox sets a new benchmark in LED flame technology. Exclusively developed by Real Flame to offer unparalleled flame realism and brightness, along with a wealth of other great features. The hidden LED display shows the settings as they are changed from either the control panel or the slim profile remote. Features a programmable thermostat to provide precise heating in Celsius or Fahrenheit, timed shut off, and dynamic embers. Requires open clearance from the top and back. Provides supplemental heating for up to 1000 square feet. Heating Area 1,000 Sq. Ft.
Real Flame Company warrants Real Flame ventless fireplaces and accessories to be free from defects in parts and workmanship under normal use and service for a period of 90 days from the date of purchase. Could I purchase an old fireplace mantel and then put this inside? If so, how would it work? Obviously it would need to fit a certain size. And how could I hide the fact that they are separate if it requires clearance on the top and back (I think it says)? And would I need to place a barrier beneath it for the wood floor? Thank you! 1,000 Sq. Ft. 400 Sq. Ft. 450 Sq. Ft. 400 Sq. Ft.